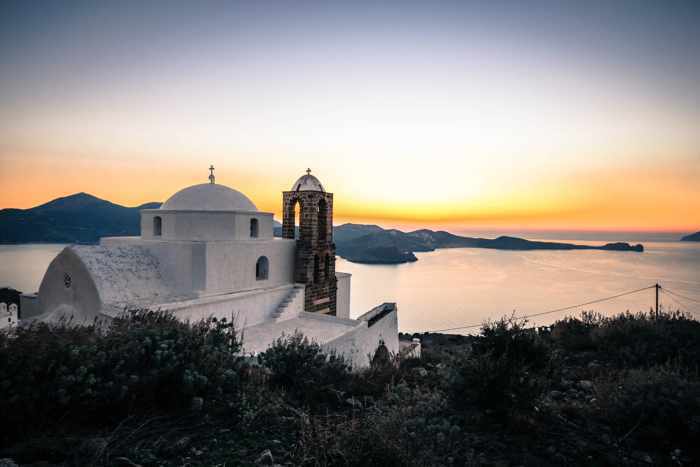 In Greek Islands: How to choose the right one for your holiday, a July post for CNN Travel, writer Sanjay Surana singles out Milos as boasting the best beaches. “Some have white sand, some black, some are rocky, others offer the satisfying sensation of crushed shells underfoot, with water ranging from emerald to aquamarine to cobalt blue. 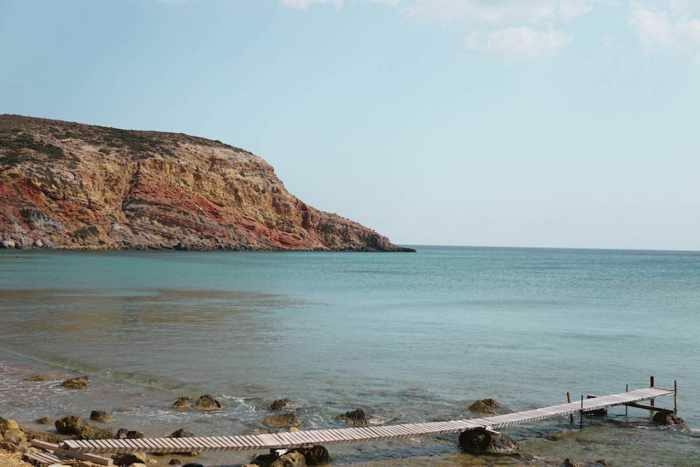 With a heavily indented coastline (on a map Milos resembles a mutated crab) and pretty little coves at every turn, Milos has about 80 fine beaches, many only accessible by boat,” Surana says. In June, Britain’s Conde Nast Traveller took a look at Milos in the article Orange Crush, which featured effusively descriptive text by writer Timothy O’Grady and alluring photos by Andrew Urwin. 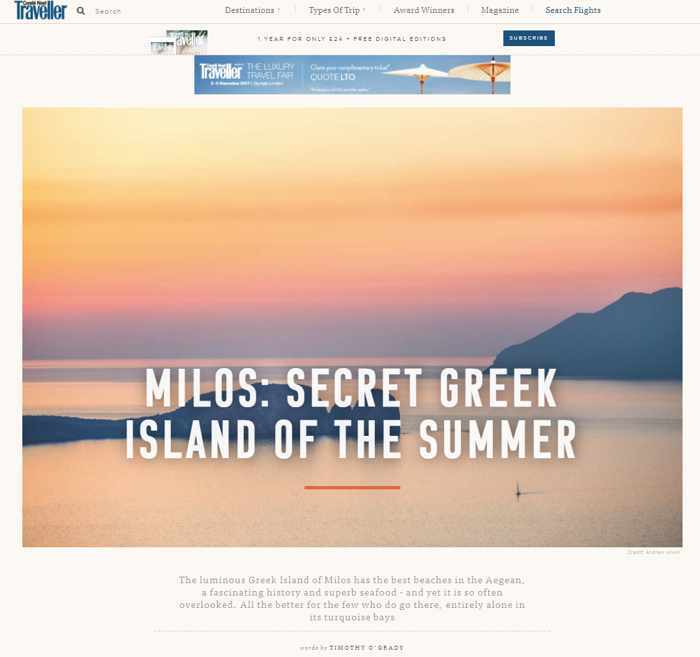 It can now be read on the magazine’s website, where it is entitled Milos: Secret Greek Island of the Summer. O’Grady recounts staying in the “tiny and isolated” settlement of Skinopi on two visits to Milos, both times choosing truly untypical accommodations — a rented syrma (the Greek name for a style of fisherman’s boathouse unique to Milos). He goes on to call the island “an astonishing spectacle of colour and form,” with dozens of impressive beaches and utterly fascinating landscapes. “It also has catacombs second only in historical significance to Rome’s, the remains of an amphitheatre that once held 7,000, a pretty capital in Plaka with labyrinthine streets, a castle on a high summit, and archaeological, maritime, ecclesiastical, folk, war and mining museums. You move through monuments of stone and never see the same thing twice. Even the open-cast mine at Voudia will amaze you. It’s like a gigantic, multi-coloured mineral version of Chinese terraced agriculture,” he writes. Adding that “you cannot get the full impact of Milos unless you take in its circumference from the water,” O’Grady relates how he was enthralled by the startling coastal rock formations he observed during a boat tour around the island — an excursion that I have often recommended as a “must” for people heading to Milos. The article includes a gallery with 29 images, plus links to suggested accommodations and places to eat. Also in June, Milos was included in The 6 Best Places to Travel This Summer, a short piece Eustacia Huen wrote for Forbes magazine. 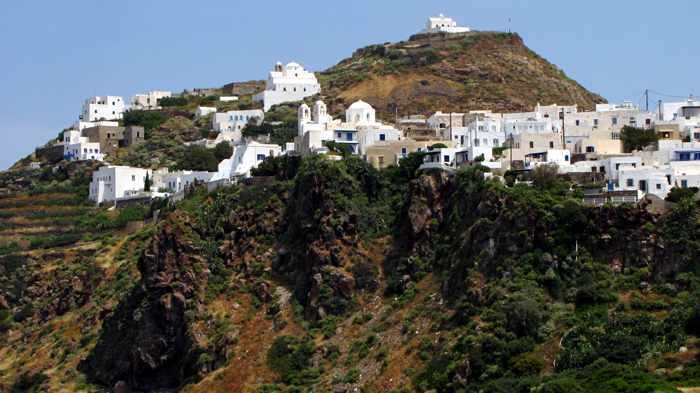 Milos ranked #3 on the list, which was compiled by Nancy Novogrod from the bespoke travel planning firm, Essentialist. Novogrod cited Milos for “the luxury of seclusion and an authentically local escape,” and recommended two “stunning places to stay”: Voronoi’s Corrals, “a glamorous house on a stone cliff with its own olive grove,” and Skinopi Lodge, “three stylishly simple and secluded stone villas” on a 9-acre seaview property. If you’re an architecture and design enthusiast, you may already be familiar with Voronoi’s Corrals — it has been featured in photo profiles on dozens of design and lifestyle sites over the past five years, including this article on dezeen.com and this post on archdaily.com. If you would like to stay there, contact the villa booking agency Five Star Greece for information about rates and availability. 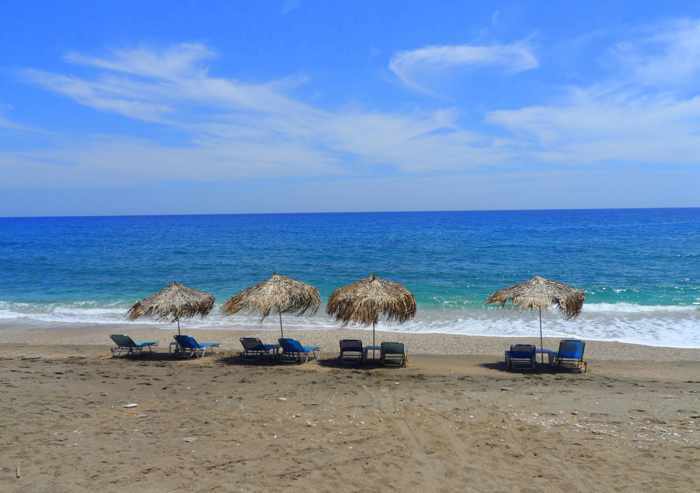 An Aline Dobbie picture of sunbeds on Paleochori beach, in front of Sirocco restaurant, which is known for dishes cooked in volcanic sand. There are dozens more inspiring images of the island in Aline’s Milos photo gallery. 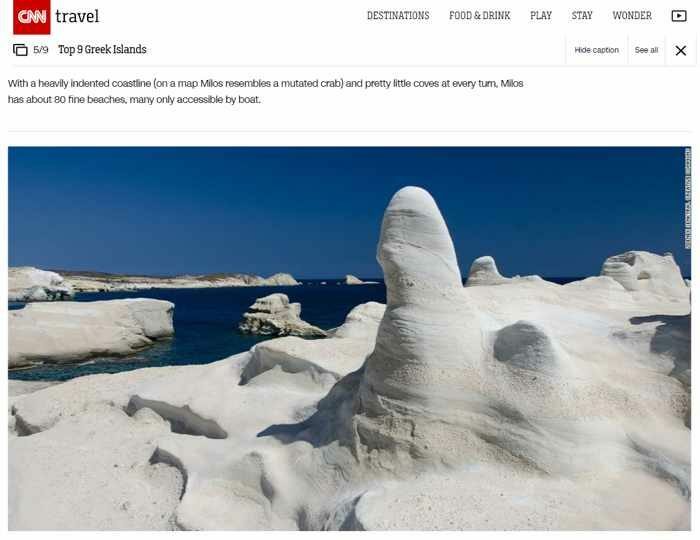 The website We Blog The World also spotlighted Milos in June, publishing a series of photos by travel writer Aline Dobbie in a post awkwardly entitled Milos: Land of the Venus & Cycladic island in the Aegean Sea. The feature includes 11 photos with brief descriptive text, as well as a link to an image gallery containing several dozens of beautiful photos that will make you wish you could be on Milos right now. In May, the U.S. magazine Conde Nast Traveler published an informative and enticing article entitled Milos’ Moment. Penned by its regular travel contributor Eleni N. Gage, the piece has since been posted in the magazine’s online edition under the heading: Milos is the untouched Greek Island you’ve been looking for. Gage relates that when she decided to visit Milos after someone recommended it as a “must-see,” Greek luxury travel experts told her there were only a couple of “nice-ish” hotels on the entire island — and they were fully booked for her travel dates. But she was able to enjoy three nights at a brand-new 4-star boutique hotel, Milos Breeze, which had opened only two weeks prior to her trip, before she relocated across the island to spend the rest of her time at Skinopi Lodge. The vast variety of Milos sights, historic attractions and stunning natural features led Gage to wonder why the island hasn’t become one of the leading tourist destinations in the Cyclades. Noting that the island’s economy has long been based on harvesting its rich resources of such minerals as bentonite, bauxite, silver and kaolin, Gage observes that “the mines are arguably the reason why Milos has been overlooked for so long, written off as an industrial island.” Yet those minerals are the very reason why Milos has the incredibly colourful and diverse landscapes that astonish and delight its visitors, she acknowledges. Another key reason, according to a local engineering professional she interviewed, is that “Milos wasn’t in fashion” when Greeks had money in the decade before Greece’s financial crisis started in 2008. But as the country’s economy shows signs of gradual improvement, Milos has begun to attract “unique, thoughtful development, not mass tourism,” Sofia Vamvouni told Gage. In passages that left me feeling green with envy, Gage recalls viewing Milos’s marvellous coastline during a private speedboat trip with one of her hotel hosts. Read her description and you’ll understand why I keep telling people that an island boat tour is something they must do while visiting Milos. 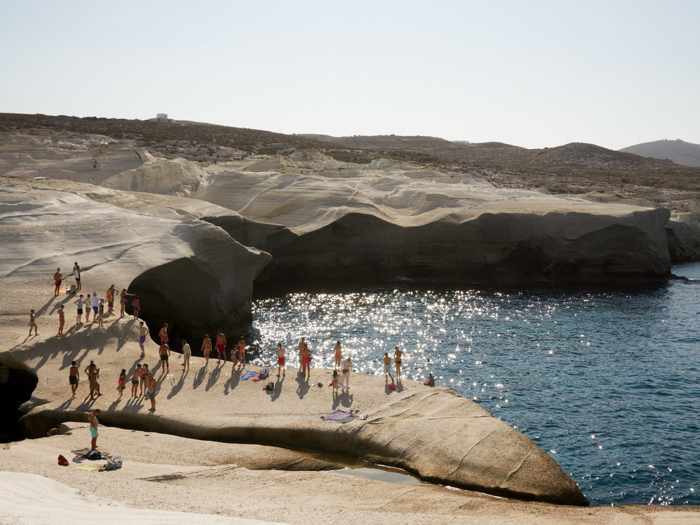 In March, the website We Are Travel Girls published Milos: The Cyclades’ Hidden Gem , featuring several photos by Toronto-based photographer and adventurer Sammie Chan. Writing that Milos “has the most beautiful landscapes I’ve ever seen,” Chan noted that a boat tour to the island’s fabled Kleftiko cliffs gave her a unique opportunity to swim through coastal caves once used as hideaways by sea pirates. In February, the travel website The Culture Trip published Top 10 things to see and do in Milos island, Greece. Authored by Brussels-based writer/photographer Ioanna Sakellaraki, the list includes the island’s capital, Plaka, several picturesque fishing settlements and seaside villages, historic sites from ancient times, and beautiful beaches, and is illustrated by her own breathtaking photos. We have been to half the places on her Top 10 ranking — Plaka, Sarakiniko, Firopotamos, the catacombs, plus the ancient theatre and nearby site where the Venus de Milos sculpture was discovered — and agree they shouldn’t be missed. We’ll try to see the other five next time we return to Milos. A woman wakeboards near the soaring coastal cliffs at Kleftiko. The photo, by travel stylist Maria Paradisis, is from her Instagram page Where in the World is Paradise. Milos got first mention in the article A travel stylist shares her top five destinations for 2017, published by Vogue Australia in January. Milos was described as “an undiscovered paradise” by Maria Paradisis, who notes that the Venus de Milo sculpture of Aphrodite, displayed in Paris’s Louvre museum, “is not the island’s only claim to fame.” So are its more than 70 beaches, many of which are noteworthy for their incredible rock formations, she said. Also in January, Milos was recommended for specialty walking and swimming vacations in The 50 best holidays in Greece, an article published by England’s Sunday Times newspaper. Have all these inspiring reports got you counting down the days until you can visit Milos yourself? I think in some publications any island other than Santorini is considered to be more “secret” though that’s hardly true. It’s worth the trip just to witness its beautiful geography.